Narcissus pseudonarcissus has developed several adaptations that give it an increased opportunity for survival. Though it may seem weak and easily uprooted by a garden shovel, in the wild, the daffodil can survive hardily. The daffodil's color, toxicity, bulbs, and temporal flowering specifications all serve as advantages towards its persistence in its wild habitat. The color of a daffodil is pivotal for the attraction of insects, which serve as pollinators for the plant. Daffodils, with their bright yellow petals, prove enticing for bees, butterflies, and other organisms that help spread the pollen of the daffodil, in order to grow new plants. Having attractive coloring can help daffodils gain favor over duller-appearing plants, thus allowing them to promulgate with more widespread results. Since the daffodil does not move at all, its only method of successful distribution is by transport of its pollen by insects. The relationships between such organisms and the wild daffodil can be explored in detail on the interactions page. Toxicity is a major adaptation for the wild daffodil, one that can save its life. As will be explained in more detail on the facts page, daffodils are highly poisonous, due to the presence of deadly alkaloids in these plants. These toxic alkaloids cause unpleasant results in animals that eat them, including vomiting and even death. If an organism consumes a daffodil, it will most likely never try eating that plant again, due to an extremely negative association between the consequences and the daffodil. Thus, Narcissus pseudonarcissus protects itself from predators that would otherwise munch away at the plant. The bulbs of the daffodil are a crucial adaptation of Narcissus pseudonarcissus. 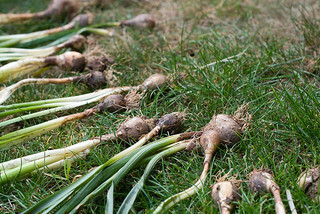 Bulbs allow the plant to grow and survive underground, even laying dormant during cold periods. Inside the bulbs, the immature plant is nourished by carbohydrates. The bulb also helps provide security and protection. Since bulbs are found underground, they avoid harsh winds, drought, intense heat, and other adverse circumstances. Discover more about the importance of bulbs on the reproduction page. 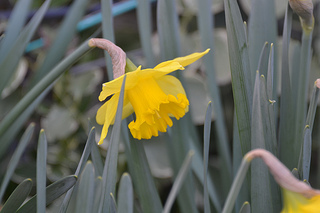 Finally, flowering early in the year provides an opportunity for daffodils to receive much-needed sunlight before trees above them block the light with leaf growth. Daffodils start growing above ground just after a cold winter, giving them a head start over larger plants that may consume more resources. Narcissus pseudonarcissus is one of the first plants to emerge from the chilly soil, to seek necessary sunlight before its peers.